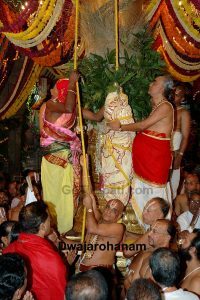 Dwajarohanam, This event is performed on the first day (evening) of the fete inside the temple, signalling the start of the Brahmotsavam. 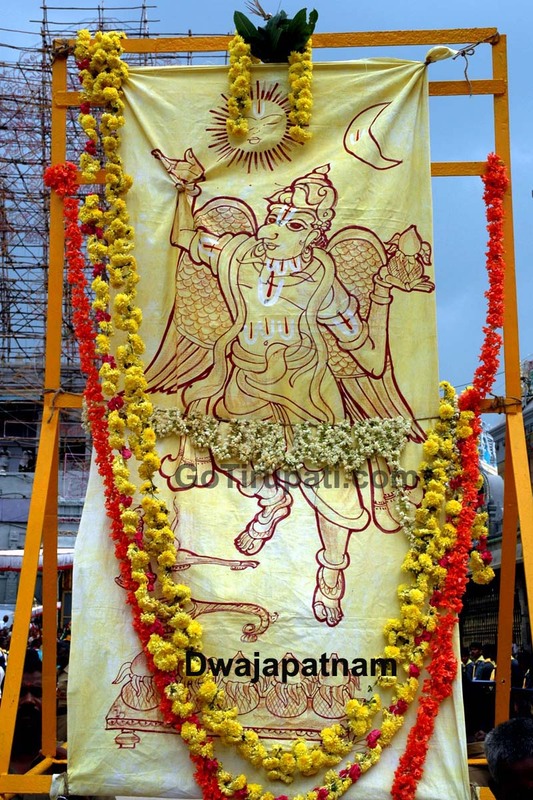 The sacred yellow flag with the imprint of Lord Garuda is ceremonially hoisted atop the flag post at the auspicious Subha muhurtham amidst chanting of Vedic hymns and to the rhythmic beat of temple drums. 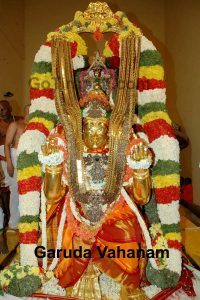 Prior to the divine ceremony, the processional deities along with parivara deities like Anantha, Garuda, Chakra and Vishwaksena, are taken around the mada streets (four streets encircling the sacred shrine) in a grand procession. 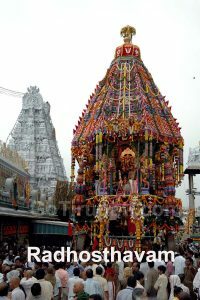 It is widely believed that Lord Garuda goes around the temple complex extending invitations to all the supernatural powers like Yakshas, Gandharvas, Kinneras, Kimpurushas and Rishis and to the entire Devatha community including Indra, Yama, Agni, Kubera, Varuna, Vayu and other heavenly bodies to take part in the religious festival. 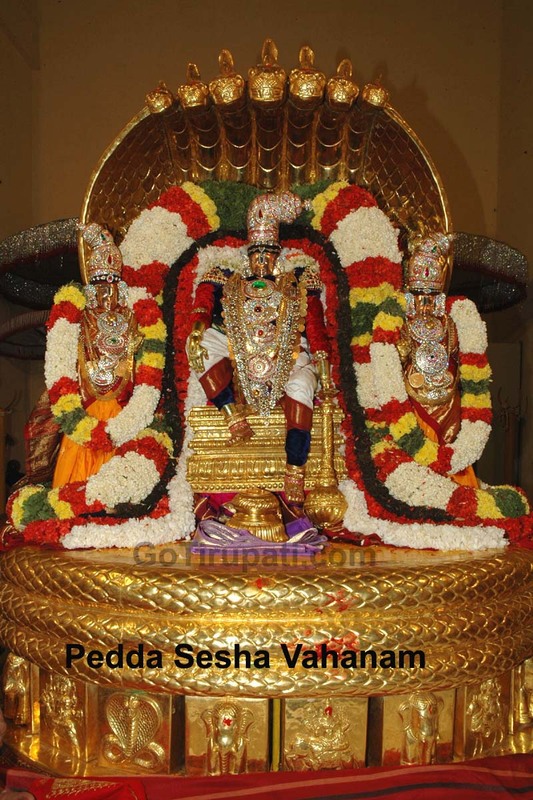 Pedda Sesha Vawhanam, Later in the night, the Lord flanked by his two divine consorts — Sridevi and Bhoodevi — takes a pleasure ride on the mighty seven-hooded serpent, the tastefully decorated golden Pedda Sesha Vahanam. 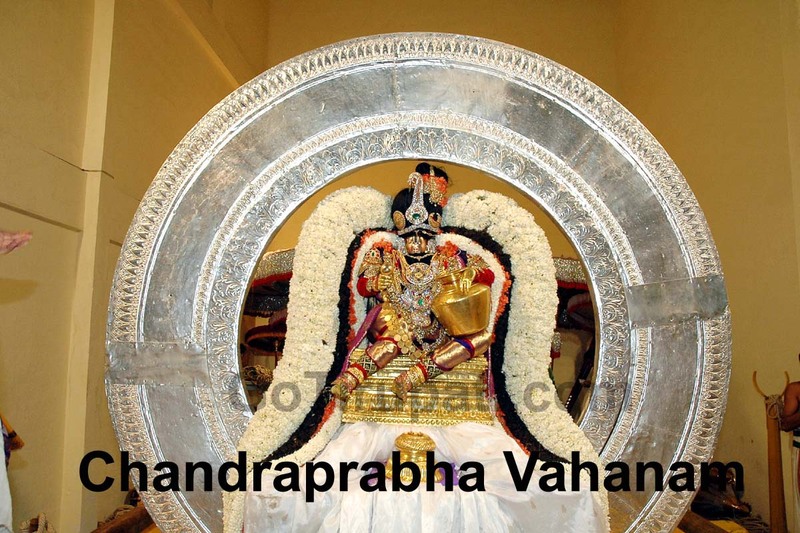 The seven hoods represent the seven hills of Lord Venkateswara. 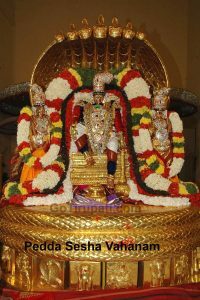 It is believed that it is on this mighty Adisesha that the Lord reclines at his heavenly abode in the Milky Way. It is in appreciation of his services that the Lord bestowed him the honour of being his first Vahanam during the festival. 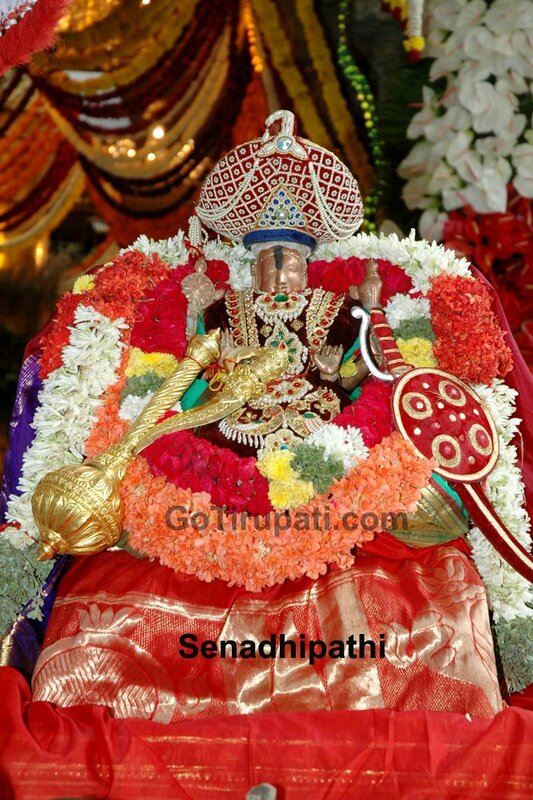 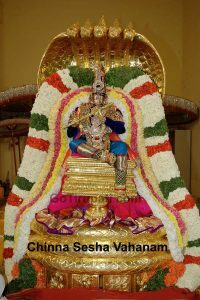 Chinna Sesha Vahanam, On the second day in the morning the deity is taken around the temple streets on the golden Chinna Sesha Vahanam, also believed to be the serpent Vasuki. 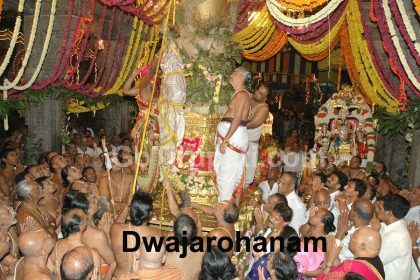 dwajarohanam The procession, it is believed, is organised to enlighten devotees on the importance of the hidden Kundalini energy within Man. Hamsa Vahanam In the night, the Lord is taken out in a procession on the Hamsa (Swan) Vahanam playing the veena. 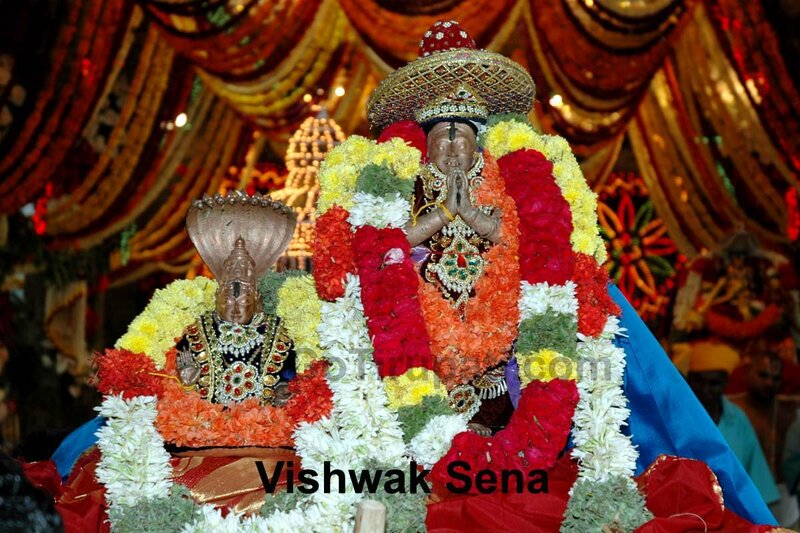 The swan is believed to have an inherent ability to separate milk from water. 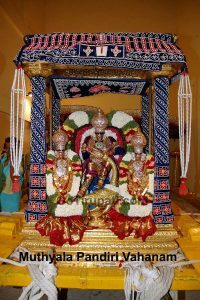 Likewise, the Lord guides mankind to lead a sanctified life, bestowing on it the wisdom to shed bad qualities and retain noble virtues. 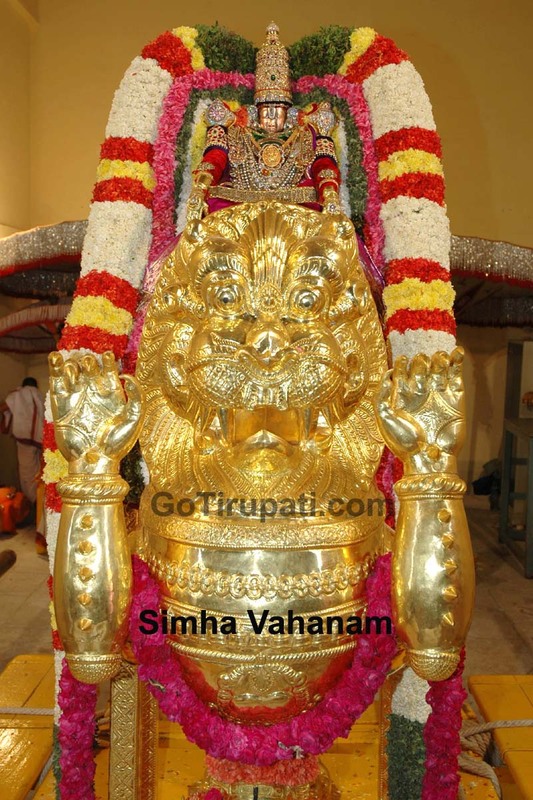 SimhaVahanam: On the third day in the morning the Lord steps out of the temple complex on the Simha (Lion) Vahanam. 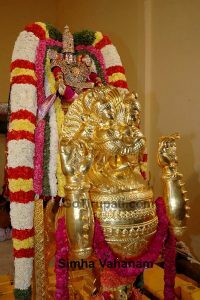 According to mythology, the Lord as King Lion is an embodiment of power and speed, a powerful entity born to remove evil spirits and harmful elements and protect the righteous and poor. 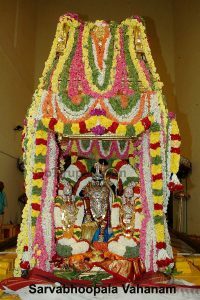 Mutyapu Pandiri Vahanam In the night, Lord Malayappa Swamy along with his two consorts ride the Muthyappandiri Vahanam — a pandal shaped carrier decorated with expensive and resplendent milky white pearls — spreading the message of peace, love and co-existence in society. 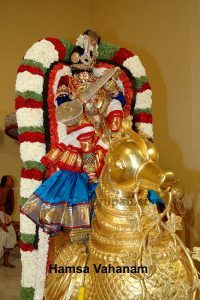 Kalpavriksha Vahanam On the fourth day in the morning Lord Malayappa, in the company of his divine consorts, rides a golden Kalpavriksha (Tree of boons) Vahanam, bestow ing fortunes on his devotees and fulfilling their wishes. Other celestial powers like the divine Kamadhenu and Chintamani form part of the assemblage atop the vahanam. 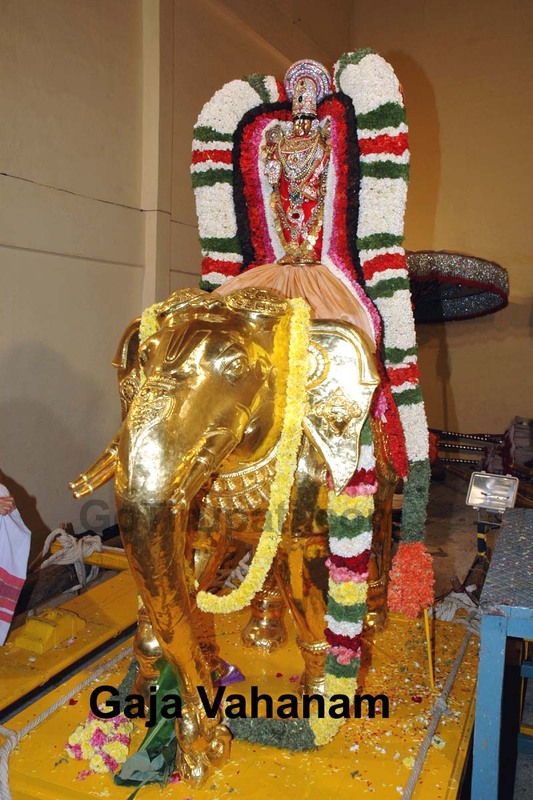 Sarva Bhoopala Vahanam The night witnesses Lord Ma layappa Swamy riding on the Sar- va Bhoopala Vahanam spreading the message that all the Dikpala kas (guardians of the eight car dinal directions) governing the Universe are under his direct control and vigilance and that mankind prospers with timely rains. 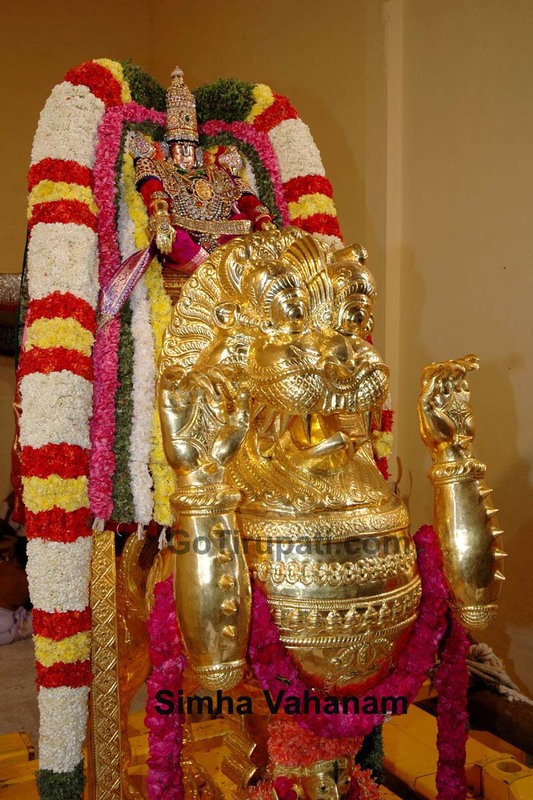 Mohini Avataram On the fifth day in the morning, the Mohini Avataram is organised, commemorating the Lord’s incarnation as Mohini (the celestial beauty). 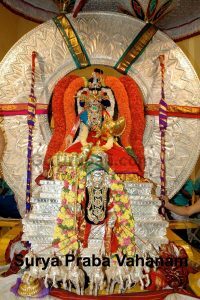 Dressed in the attractive female at the tire, the Lord (in female disguise) is taken out in a grand procession on an exquisitely decorated ivory palanquin with a golden parrot in her right hand and a long Mangala sutra made of gems and diamonds In the other. 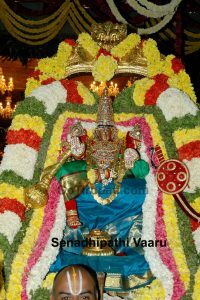 The Mohini avataram is organised to illustrate the benevolence extended by the Lord to those who follow the path of virtue. 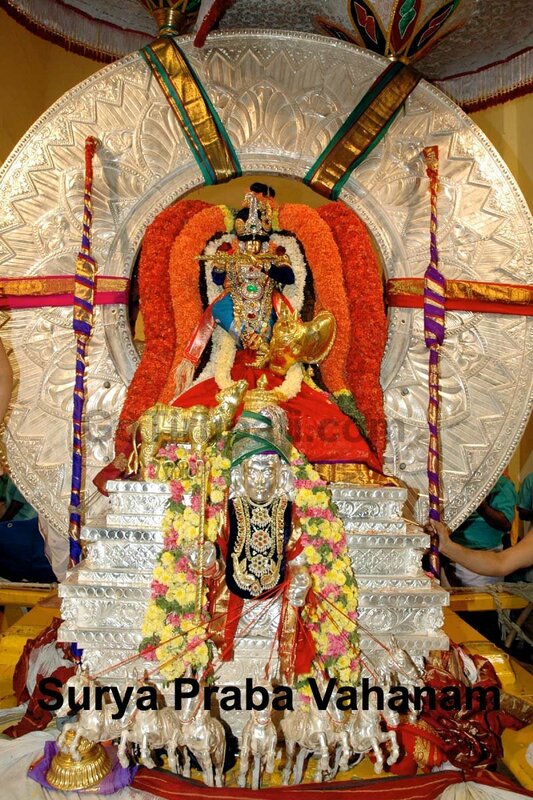 Garuda Seva Considered to be the most 9 auspicious of all the events during the Brahmotsavam, this festival is organised in the night. 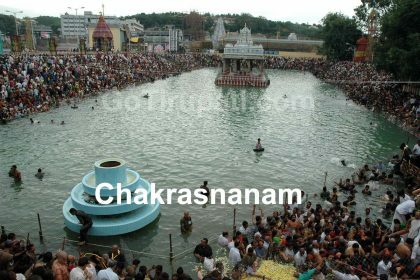 Several lakhs of devotees from different parts of the country converge to witness the celestial event which on several occasions had concluded in the small hours of the following day. Adding grandeur to the event, antique and precious ornaments like the centuries-old Makara Kanti and Lakshmi haaram, whose history is rooted in temple legends, adorn the deity during the procession. The deity also wears the sacred garlands from the temple of Goddess Andal in Srivilliputtur. 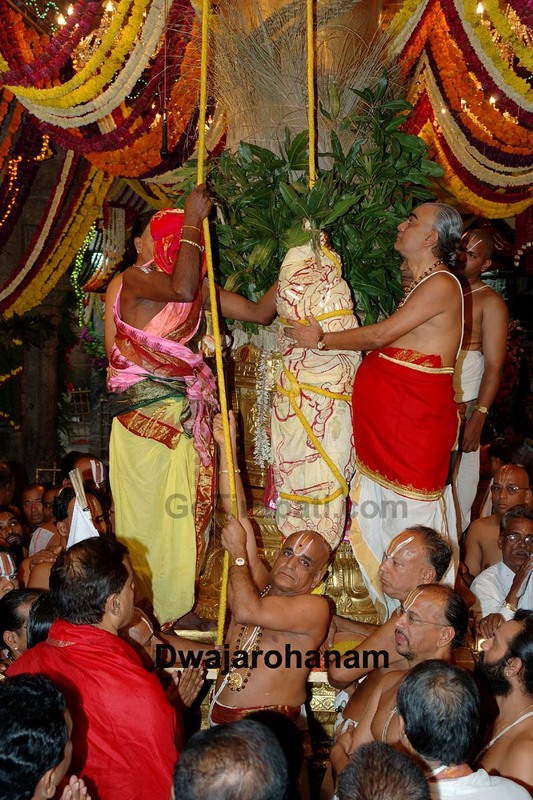 A pair of silk vastrams endowed by the Chief Minister of Andhra Pradesh on behalf of the State government is also presented to the deity. 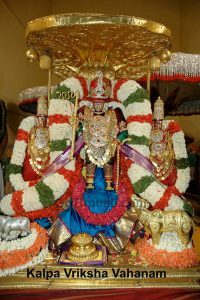 Hanumantha Vahanam On the sixth day in the morning, Lord Malayappa, donning the role of Lord Rama and equipped with a golden bow and arrow, moves along the temple streets mounted atop the Hanumantha Vahanam. 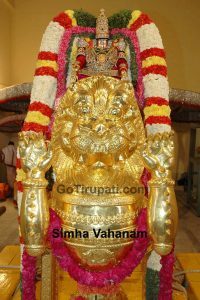 Hanuman is not only considered an ardent devotee of Lord Rama but also an exponent of all the four Vedas, besides being an embodiment of wisdom, strength, success and bravery. 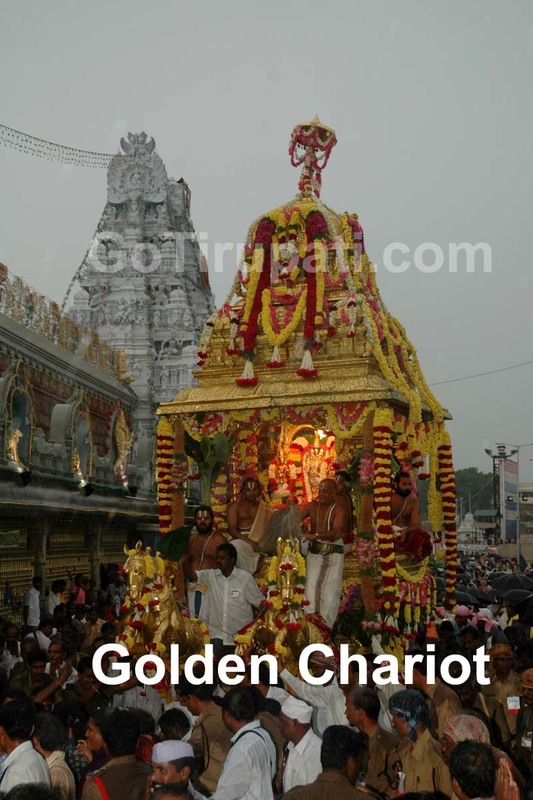 Swarna Ratham:The procession of the Golden Chariot is organized in the evening during the twilight hours. Even though the event finds no place in the temple’s history, of late it has turned out to be a fas cinating procession where only women are allowed to pull the dazzling chariot with the proces sional deities on it. GajaVahanam, Later in the night, Lord Venkateswara enthrals devotees on the Gaja (Elephant) Vahanam. 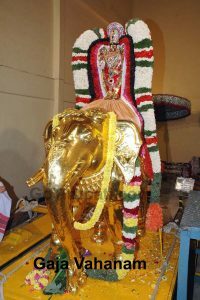 Among other animals engaged in the service of the Lord, the elephant commands a special place, being the celestial vehicle of goddess Mahalakshmi, the divine consort of Lord Vishnu. 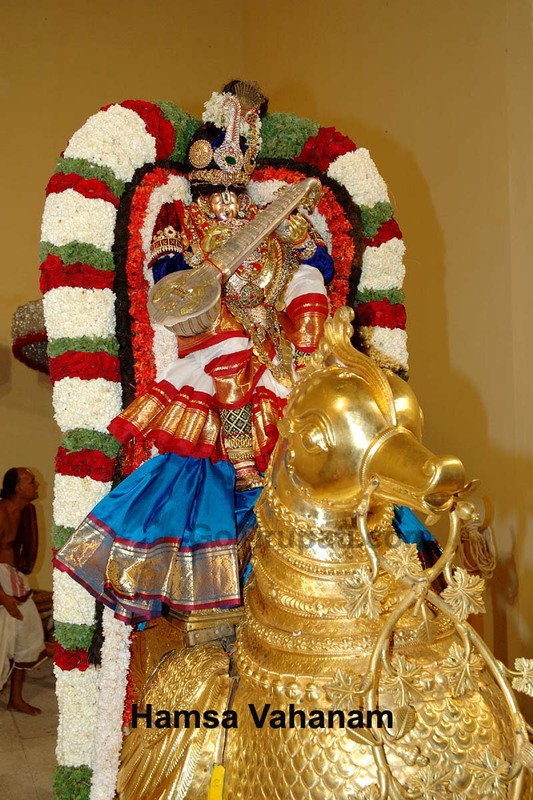 To please his consort and bless the devout with all prosperity, the Lord takes a pleasure ride on the Gaja Vahanam. 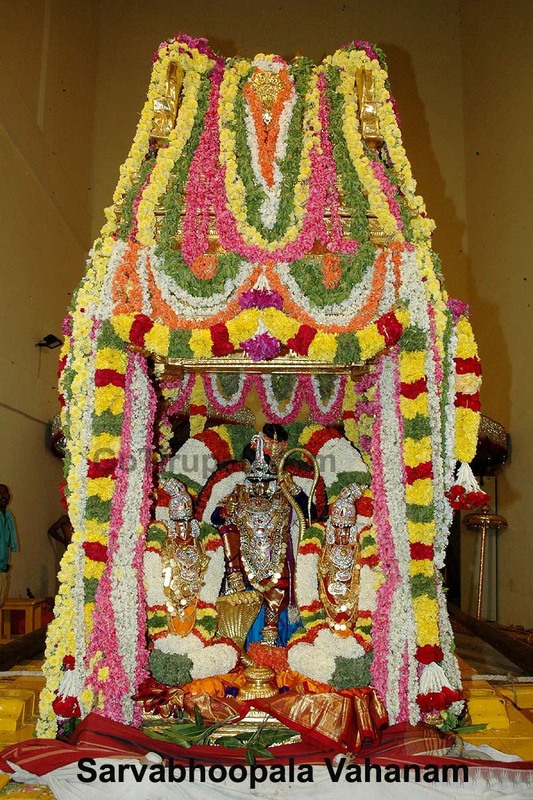 Suryaprabha Vahanam On the morning of the seventh day, the Lord, equipped with a Vajra kavacham, rides along the thoroughfares of the temple town on the dazzling Suryaprabha Vahanam. 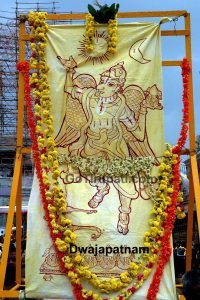 13 Mythology has it that the Sun God (Lord Surya) is the key architect of the life of humans, animals and plants from whom even powerful luminaries receive luminosity in the cosmos. 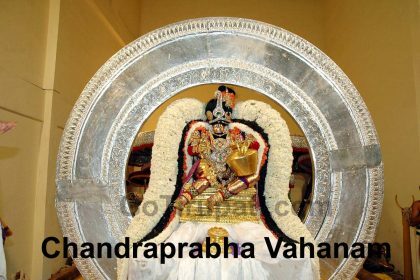 It is widely believed that witnessing this vahanam not only provides sustained life but also relieves one of the physical ailments. 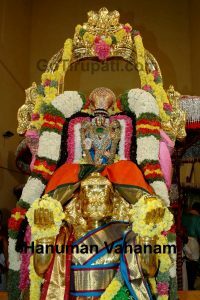 Chandra Prabha Vahanam The night witnesses the divine procession of the Lord on the elegantly decorated Chandra Prabha Vahanam, reminding all of the coolness and brightness of moonlight. 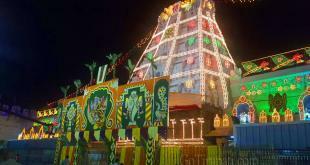 Rathotsavam It is organised on the penultimate day of the festival. At the Subha muhurtham, the Lord along with his consorts mounts the gigantic 50-feet-high wooden chariot which is pulled by devotees along the four Mada streets encircling the holy shrine. 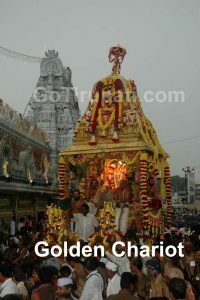 The chariot with a golden umbrella tied to its crest is tastefully decorated with flags and festoons. 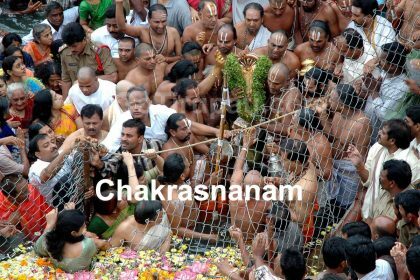 Religious fervour pervades the town as thousands of devotees take part in the procession and pull the chariot by its bulky rope. 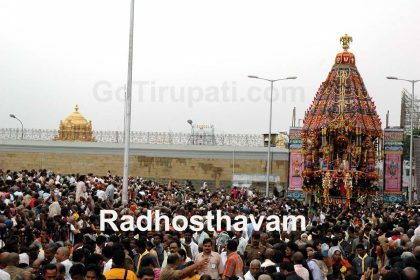 The air remains electrified with the chanting of Govindanamam as the huge chariot moves down the lanes. 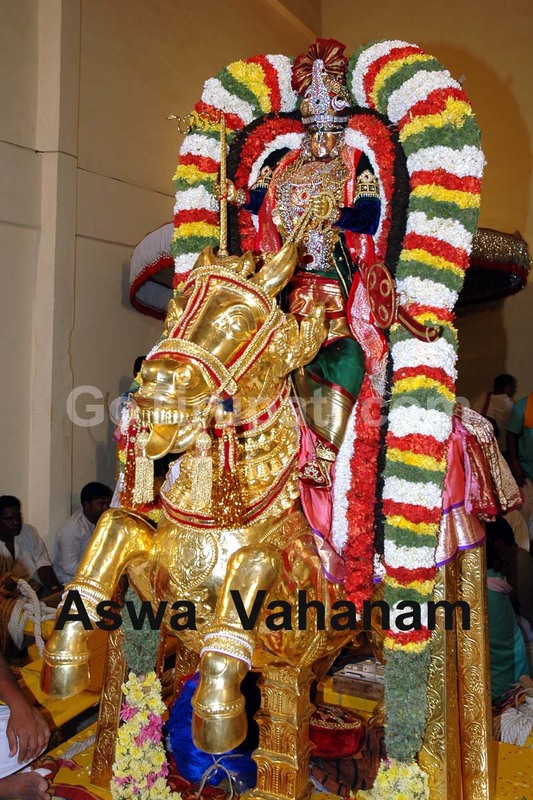 Aswa Vahanam: As the mega-festival march es towards its conclusion the procession of the Aswa (Horse) Va hanam is organised in the night. This signifies the avathara of Kalki — a good Samaritan who fights the evil and protects the virtuous. 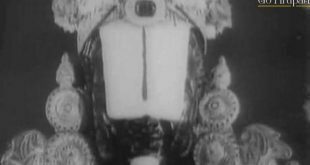 The message for mankind is clear. 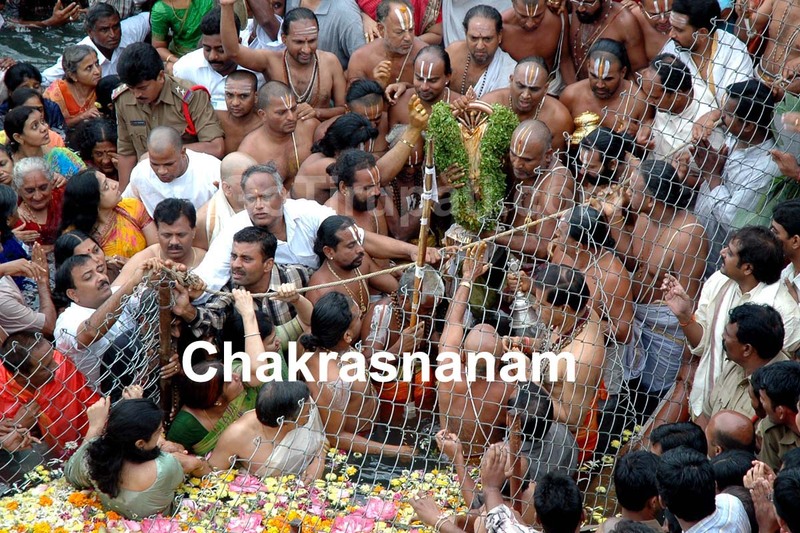 Keep away from Kalki dosha and pray the almighty to ward off the impact of wrongdoings. 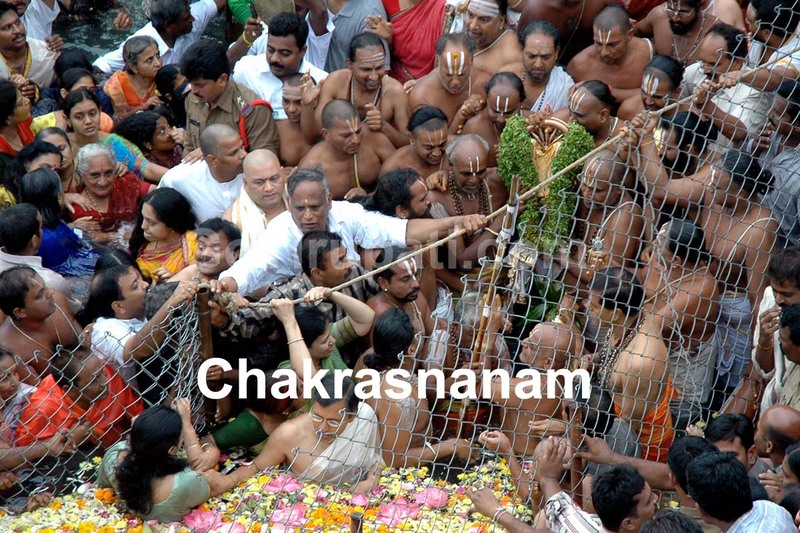 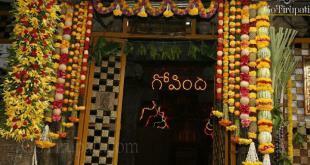 Chakrasnanam: The nine-day Brahmotsavam has a grand finale with Chakrasnanam. Snapana Thirumanjanam (celestial bath) is performed to the deities on the north-west banks of Swamy Pushkarini (temple tank), followed by the immersion of the idol of Chakra azhwar in the tank’s waters in the presence of tens of thousands of devotees.